I love some lentils. Lentils are extremely healthy for you. 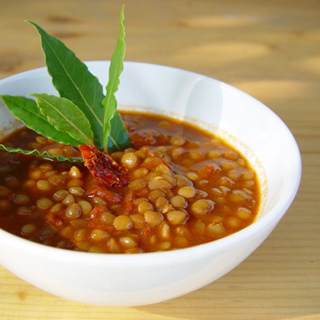 Lentils are a legume and they are a rich source of anti-oxidants and beneficial fiber. They come in a variety of colors from brown, pink, green, to orange. I recommend the green, pink, and orange varieties as the more color a food has the more anti-oxidant rich it is. Any lentil will do though as lentils are a great source of anti-oxidants. Lentils are rich source of folic acid, iron, manganese, plant protein, phosphorus, copper, and potassium. Lentils are known as one of the five healthiest foods in some circles and have been consumed for thousand years in places like the Middle East and India. They are one of the first foods ever to be cultivated and were mentioned in the Bible. Lentils truly make a satisfying and delicious meal. Lentils are definitely recommended as they are a rich source of iron but lentils should be soaked for at least 10 hours before cooking as lentils contain phytic acid. Phytic acid is an anti-nutrient component and prevents the absorption of the many minerals found in lentils. The soaking of lentils eliminates or reduces the phytic acid content in the legume or bean. This recipe is backed with nutrition and anti-oxidants as curry has shown to be a extremly rich source of anti-oxidants. Curry powder contains turmeric and turmeric is a spice that is rich in anti-oxidants. I know you will absolutely love this delicious recipe I created. It is packed with flavor, nutrition, and healing and health promoting components. Soak a pound of lentils in enough purified water to cover overnight or for at least 8 hours. Strain lentils and discard soaking water. Turn on heat to high and fill covered pot with 6 cups of purified water and then add soaked lentils. Add sea salt, olive oil , tomato sauce, spices, herbs, garlic, and chopped veggies to the pot and cook on high heat for 10 minutes. Reduce heat to low and then cook for another 35 minutes or until tender. Garnish with cilantro and serve with brown rice or quinoa, a whole grain consumed for thousands of years in South America. Enjoy!